Description: With its compact habit and bright orange flowers, butterfly weed is a great addition to perennial beds and mixed borders. Grows from 1 - 2 ft.
New growth tends to emerge late in the spring. Plants are easily grown from seed, but are somewhat slow to establish and may take 2-3 years to produce flowers. 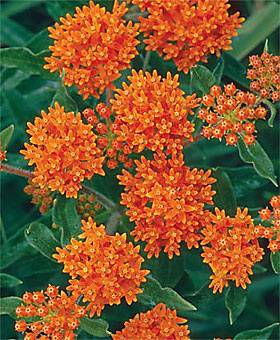 Butterfly weed does not transplant well due to its deep taproot, and is probably best left undisturbed once established. Growing Conditions: Undemanding, grows in rocky, sandy, and dry soil. Prefers full sun. When planting in heavy clay soil, dig to a depth of at least 6 inches and amend with compost or sand to allow the taproot to establish deeply. Benefit to pollinators/wildlife: Most milkweed species are hosts for the monarch butterfly. 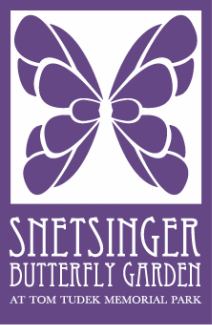 Butterfly weed is highly attractive as a nectar source for a variety of pollinators.